Many of you might have wanted to use pages for Blogger like in Wordpress.But unfortunately Blogger doesn't provide any thing like Wordpress Pages.But there is still something that can be done.To know what i am talking about,just have a look at my About Page . Now publish your post.We will use this as a pge.You might want to hide the social bookmarking icons and such other stuff from your ‘’pseudo pages’. Actually our blogger template is full of different divisions and we style each of these divisions using CSS.Using CSS rules,it is also possible to hide some of these divisions.So what must we be doing?We need to hide some unwanted divisions on our new pseudo page. Here i have given some list if divisions which should be hidden.If you need to hide any other divisions you can add this to the list but make sure to separate the different divisions using commas. Thank you very much! 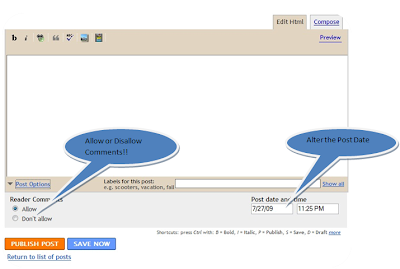 This is very useful in Blogger. Any idea how to hide some widgets too ? offcourse you can do the same with widgets too.. Thanks. I have wanted to create a page for my blogger blog for some time now. Thanks to you..now I know how. Hey! This is awesome =) Question: Is there any way to hide an individual post from the homepage and archive, without hiding the rest of them? Right now I'm using two blogs... one for info pages and image galleries and the other for blog posts. It'd be really neat to just be able to use one blog for the whole thing, though. Less confusing in a google search, etc... plus it would look nicer not to skip from one site to another =) Thanks! I managed to impliment this hack perfectly, however since I used your "Adsense Below the post title hack" I can't get rid of the adsense code on the pages. I noticed on your "about me" page, you prevented the adsense code from showing, I was fiddling around with the hack but I had no luck. Can you please explain how to hide the adsense code from showing up in the pages. Somebody help me do this!!!! Thanks for the wonderfull advice. o comments: still appears how to I get rid of that? I have just one small query, i have added 2 pages to my blog namely asp.net and tutorial. Now i want to define some links while clicking on any of the pages a new link should be open. You make me confuse now! I actually want the page to be Page 1, 2, 3, ... like wordpress. Anyway your post is wonderful. Thank you so much. This may be my goal for adding Blogger pages. Thanks for your information, Nice Share...^^..